I want to thank the organizers of the Championship, journalists and all my fans for great support. I am very glad and proud that I’ve become a Champion representing China. Despite the fact that I outplayed Galliamova I think that Russian players are very strong and a tough and interesting fight is still ahead. And of course I am very grateful to my coaches who assisted me here. - What awards do you expect to get on your coming back to China? XY: I haven’t thought about it so far. It’s just a great pleasure to come back home with a new title. I am sure to be well received because so many people supported me. What other achievements of such a level do you have? XY: I won the World Cup in 2000 and 2002 and I am a three time Olympic Champion 2000, 2002 and 2004 as a member of our National Team. 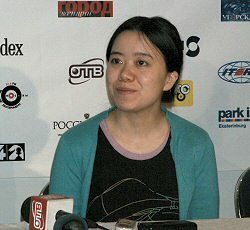 What is the World Champion Xu Yuhua going to do tonight? XY: We’ll certainly celebrate my victory with our Chinese delegation. How can you characterize your main opponent? XY: Alisa is a very strong opponent and I really think that I was just lucky to win 2 games of 3. Aren’t you going to study Russian? XY: I think it’s quite useful for a chess player to learn the language of this country and I am likely to study it in the future. Are you going to take part in the forthcoming “North Urals Cup”? XY: Today I’ve decided to give to the public the fact of my expecting a baby. I am going to deliver in September and all my nearest plans are closely connected with this event. You performed brilliantly at the Championship. How did you manage to do it? XY: In fact I was in a perfect condition? Moreover , I think my baby was the one to help me.